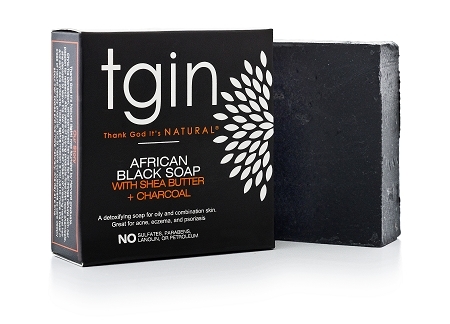 Our African black soap with activated charcoal will detoxify, cleanse, and rejuvenate your skin. This natural cleansing bar draws out dirt, debris and impurities trapped deep inside of the pores that cause bumps, breakouts and acne. Great for oily or combination skin, or for people who suffer from allergies, eczema or psoriasis. Phthalate and paraben free. Ingredients: OLIVE OIL, COCONUT OIL, SOYBEAN OIL, CORN OIL, SHEA BUTTER, HEMP OIL, ACTIVATED CHARCOAL, FRAGRANCE. Subject: Not One Breakout Since Using this Soap Precious V. Milwaukee, WI This soap is not just for your body! It is gentle enough to use on your face - especially if you have oily skin like me. It really makes my skin feel clean AND soft! Since I have started using this soap, I have not had ONE breakout. In a pinch, when I am low on hair products, I even use the African black soap to wash my hair with amazing results. My husband uses this soap after shaving and it stops those annoying razor bumps. We both love that the smell is not too strong and that it leaves our skin soooo smooth! I purchased a combination of products (3 bars of soap, butter cream, and spray serum) at the football game in Soldier Field and I am elated with the results after two weeks. I never respond to websites like this but I really needed to let someone at your company know that this is, by far, the best product I've used. This is no overreaction or over exaggeration - the best. I spent about 20 minutes talking to who I believe was the owner about how I can use the serum for aftershave and the butter and shave cream ( there was only one mango left but I let another customer have it). I thought that she was just trying to just make a sale, but to my delight everything has worked out just as she said it would. I use the black soap to shave my head rather than the butter as she suggested, and I use the black soap as soap for my entire body including face. More importantly, I have not had a single bump on my head or neck after shaving my head since I started using it in combination with the serum. I do admit that the soap dries me out but in my mind that is what the serum is for. I love the combination. I hope that you succeed in your business and that it continues to grow and prosper. This is a superior product and I will continue to purchase as long as the formula does not change. Thank you for this product.